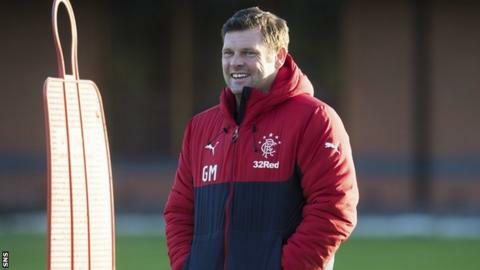 Rangers will not get carried away after stringing four wins together for the first time in 12 months, insists interim manager Graeme Murty. Gers never managed to secure more than two straight victories under previous boss Pedro Caixinha. But Murty, in charge since Caixinha's October sacking, has now overseen home and away triumphs against Aberdeen as well as wins over Ross County and Hibs. "Winning four games is a nice step. But it's no more than that," Murty said. "You'll certainly not hear the players showing satisfaction - more a determination to extend a good points haul. "All we've done is put a nice marker down - no more. "Four games in this club's history isn't a great deal. What we have to do is reach the right levels of performance and we'll pick up points from that. But we haven't achieved anything yet." Those four wins have kept Rangers in second place in the Scottish Premiership, level on points with third-placed Aberdeen, and six ahead of Hibernian, who sit fourth. The Gers withstood a barrage of attacks from Neil Lennon's men in Wednesday's 2-1 victory at Easter Road. Murty's decision to introduce defender David Bates and switch to five at the back late on has drawn comparisons with the methods used by former boss Walter Smith during two pragmatic Ibrox reigns. While the current occupier of the Rangers hot-seat denied taking direct inspiration from Smith for his Easter Road tinkering, he did confess he had recently picked the former Scotland boss' brains. "I've spoken to Walter," said Murty. "He was actually in the academy office the other day as his grandsons are here. "We sat and had a chat but to be perfectly honest, listening to the maestro talk for an hour isn't long enough. "You could listen to him all day just because of his depth of knowledge and his feeling for the club. "It's always a privilege to listen to someone like that, so I'd be naive not to go into that with as open a mind as possible." Rangers host St Johnstone on Saturday but will not have to shackle Saints' Michael O'Halloran, who is barred from facing his parent club. The on-loan winger was previously told he had no future at Ibrox by Caixinha, but Murty says that is now being reconsidered. Gers' injury problems have intensified this week, with Kenny Miller a doubt for the next Old Firm clash on 30 December after tearing his hamstring at Easter Road and Graham Dorrans ruled out for three months after ankle surgery. That may mean O'Halloran and striker Joe Dodoo - loaned out to Charlton Athletic - could be recalled. "We've talked about all the players out on loan and we're looking at all options to help the squad," Murty explained. "Some might come back but it's still being discussed. "We know Michael well. He's an established Premiership performer, so if he was to come back he'd add something to the squad. "But we need to assess all our options carefully and make the best decision for the club."